From the most remote periods Egypt has been an essentially agricultural country and it has always produced fruit, broad beans, lentils, flax and above all cereals, especially wheat and millet, which were exported in large quantities. As can be seen from the paintings of various periods which show work in the fields, the implements used have always been more or less the same as those used today. 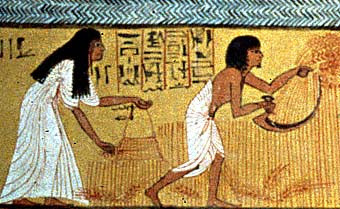 The Egyptians also practised the industrial arts and commerce. The large variety of objects found in the tombs shows that they were able to work gold, silver and copper with rare skill and that in the cutting of precious stones they reached an incredible degree of perfection. They excelled particularly in the art of adornment (rings, bracelets, pendants, earrings) which reached a series of high points under the IVth, Xllth, XVIIIth and XXth dynasties. They produced textiles of great distinction from essentially very simple materials. 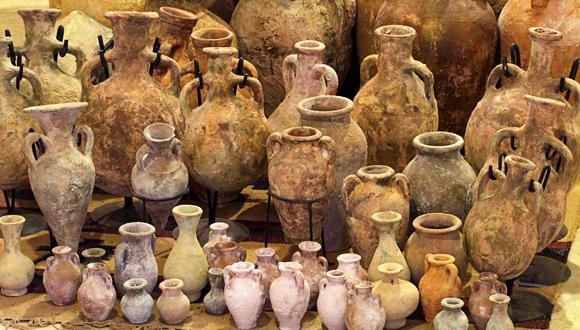 They also made pottery, glass, and enamel. They did not use money. With the peoples of Nubia they exchanged the products of agriculture and industry, wheat and onions, arms and jewels, for woods and skins, gold and ivory. Spices and incense came from Arabia while from Phoenicia they imported cargoes of cedar wood. From the XVIIIth dynasty on the Egyptians established close trading relations with the countries touched by the Euphrates and with the islands of the eastern Mediterranean. For example Cyprus furnished them with copper.